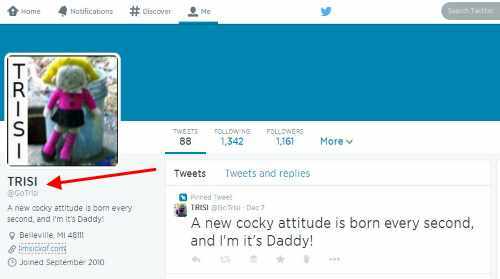 Did you know you could change the name and URL of a Twitter account? 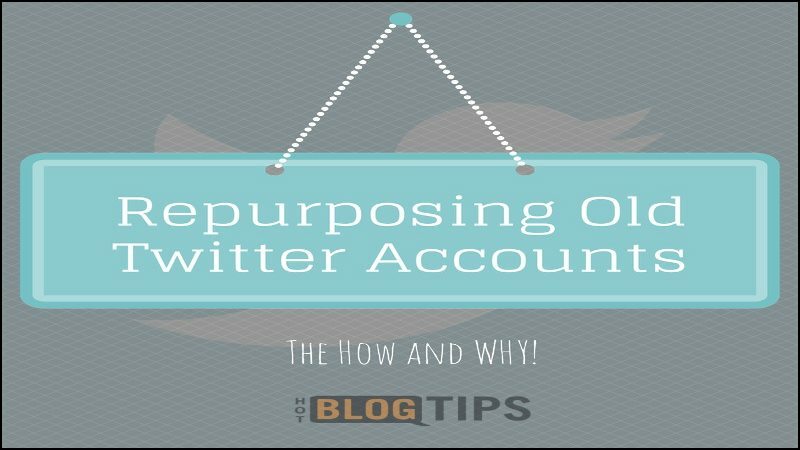 I’ll show you how to repurpose an old Twitter account you no longer use or need and put it to better use for your new brand. Changing your old Twitter username gives a great start as opposed to starting from scratch. So I mentioned last week that I was working on a new brand and I had set-up several social accounts for that brand. I wish I had thought things through before I created my new Twitter account because I have a handful of accounts laying around that I no longer use. I hope this post helps others get a nice jump on their newest Twitter accounts. How Is This Different Than Just Buying Followers? Do You Have An Old Twitter Account Or Two? I can’t tell you how many Twitter accounts I’ve deactivated in the past, several with thousands of followers. In fact, I remember writing a blog post showing the steps to deactivate and remove an old account. Now I think repurposing is a much better idea. In the example below, I changed an old Twitter account to a completely different niche. The followers and tweets of that old account have nothing to do with the new niche I’m changing to. Ideally, it would have been much better to stay within the same general niche, or close to it, but that wasn’t possible in this case. With that said, the old account still has 1161 followers and, even though they won’t be much good as far as interaction, they will help accelerate growth with less effort than starting out from scratch. These ARE real followers but I haven’t interacted with them in so long, many of them simply won’t be interested in the new topic I’ll be tweeting about. Those within the right niche WILL be more likely to follow back after I cleanup and optimize the new user profile. Changing your Twitter handle (Twitter URL) and Profile name is as simple as making a couple of changes in the settings. First, make sure the old Twitter account you want to repurpose is still active enough to be under your control. Check your associated email and password to make sure everything’s kosher. Then go into your Twitter account settings and change the “Username” to match your new brand. You should be able to easily change your Username up to 15 characters (It looks like 15 characters is the max for a Twitter Username right now) as long as your brand’s preferred username is available. If your preferred username isn’t available on Twitter or any other social media platform, I highly recommend you read How To Find Social Accounts When Your Brand Is Already Taken before you take any action. Note: Changing your username will also change your Twitter profile URL. We just changed our Username and that is the Profile URL. Now we can change our Twitter Name that shows on the Twitter profile page. You make the name change on the Profile Settings Page. 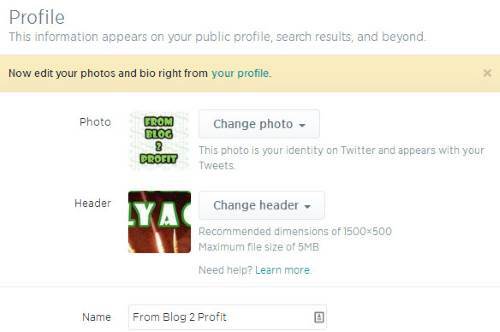 While you’re on your Profile Settings Page, this is a great time to change your URL and Twitter Bio. All of the larger social media sites allow us to showcase our branding in the form of images and Twitter is no exception. Today, although it’s constantly changing, Twitter allows us to add a Profile photo (400px by 400px), a header image (1500px by 500px) and a background image. I’m not ready to officially launch this new brand yet so I just used Paint.net to create some very fast images for my new Twitter profile. We have a nice playlist on YouTube of Paint.net video tutorials thanks to Sheryl Loch that should get you started. Now as proud as I am of that tweet, it won’t really resonate well with my new target followers in the Blog For Profit niche. Not only are the tweets no longer relevant, they’re way too old. That’s a simple fix and does not require deleting any tweets. I’ll simply create and post new tweets and as those are published; the older tweets will drop down into the archives so far they won’t be noticed. The latest Twitter update gives us the opportunity to “Pin” one of our tweets to the top so it’s the first one people will see, at least when being viewed on the desktop. This is a cool way to showcase our best content so pin your best stuff. To pin a tweet, click the three dots below that tweet on the bottom right. Select “Pin to your profile page” in the drop-down and that tweet will stay there until it is replaced with a new pinned tweet. Remember to keep this pinned tweet fresh, relevant and high quality (Your best stuff isn’t usually promotional). So now I have an established Twitter account that shows it’s been around since September 2010, with tweets already in the bin and over 1160 followers (albeit no longer targeted in this case). Compare that to a brand new account (like the one I just started) with 24 followers and 14 tweets. Which account do you think will grow faster with the same amount of effort? Like I mentioned in the beginning, most people will be more likely to follow the established profile back because it looks much more real, gives a look of higher perceived value as well as possible return benefit. It might be psychological but it works. Which profile would you be more likely to follow back? If you have an old Twitter account that you still control and no longer use, keep it somewhat active and hold on to it; it just might save you some valuable time in the future. Don’t abandon old Twitter accts, you might need them later. I’ve maintained up to 20 different accounts at the same time in the past and I’m betting I’m not alone. I seriously wish I kept most of those accounts now that I see the value in changing the username and rebranding the entire profile. Do you have a new brand in the works that could use one of your old accounts? Have you ever changed your Twitter username before? 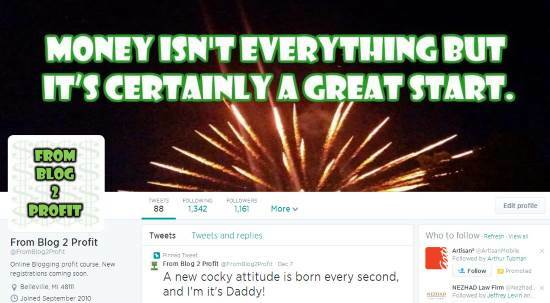 What are your thoughts on rebranding an old account? Do you think its fair game or is it a little deceiving? I’d love your thoughts in the comments below.